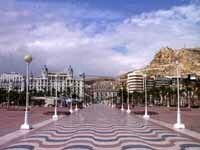 Alicante is situated on the east coast of Spain and is the centre of the popular Costa Blanca holiday region. Although Mediterranean in style, Alicante also has an African flavour with women clad in caftans and hawkers selling African carvings along the waterfront and esplanades. Alicante's historical central district, though, is filled with Baroque buildings, bearing testimony to the city's rich history and former status as a major seaport. The main thoroughfare of the city is the Rambla, lined with palm trees, outdoor cafes and ice-cream parlours serving the unusual local drink, horchata, made with almonds. There are shops aplenty, parks and gardens, marble-paved plazas and the broad Explanada d'Espanya encircling the yacht harbour with its mosaic promenade. Visitors come to Alicante mainly for the beaches, particularly San Juan which is surrounded by attractive villas, hotels and restaurants. With a resident population of more than 300,000, the low season doesn't seem to affect Alicante as much as purpose-built holiday resorts like nearby Benidorm, and no matter what time of year you choose to visit, Alicante will be alive with music, food and entertainment. With a large variety of bars, nightclubs and cocktail lounges scattered throughout the resort city, visitors will be hard pressed to name their favourite spot. The bars and clubs near the marina area seem to be the trendiest and are a hive of activity with tourists and young locals. El Barrio, in Alicante's old quarter, also features some great bars along its narrow streets and party animals looking to dance the night away will be pleased to know that most clubs carry on going until sunrise. The city has an international airport that makes it the gateway to the nearby package tour resorts such as Benidorm and Torrevieja, and ensures that the city is crowded with tourists during the holiday season. Alicante's energy reaches a peak during the last week of June each year when holiday makers and locals alike throw themselves into celebrating the unrivalled fiesta of Saint Joan.